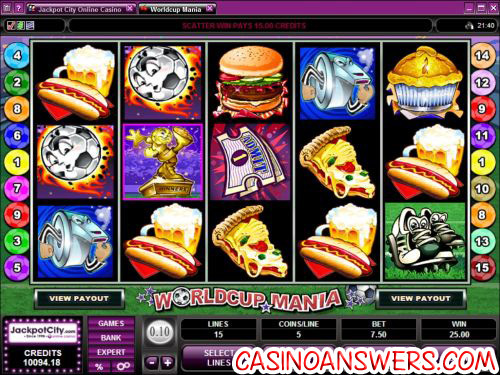 World Cup Mania Video Slot Guide & Review - Casino Answers! Worldcup Mania is a 5-reel, 15-line video slot featuring wild substitutes, free spins and a bonus game. Microgaming released Worldcup Mania in 2006 to celebrate the 2006 World Cup. You can play Worldcup Mania at River Belle Casino and Virtual City Casino.Play at this years #1 online casino for United States - Slots.LV. To play Worldcup Mania, you must first set a wager. You can choose your coin value between $0.01, $0.02, $0.05, $0.10, $0.20, $0.25, $0.50 and $1. Then you have to pick out how many paylines (up to 15) and how many coins you wish to bet per line (up to 5). You have a full range of betting options available to you in Worldcup Mania, with the maximum bet of $75 per spin. If you wish to play the maximum bet at your coin value, hit “Bet Max.” To spin the reels using your current settings, use the “Spin” button. If the game moves too slowly for you, you can always go into options and turn “QuickSpin” on. If five flaming ball wild symbols appear on an active payline in the Worldcup Mania video slot, you will win the game’s 7500 coin top jackpot. The wild symbol will substitute for all symbols in Worldcup Mania except for the scatter symbol and bonus symbol. Win 10 free spins at a 10X multiplier by hitting 3, 4 or 5 referee/whistle scatter symbols anywhere on the reels. All of your wins during the free spins feature will be tripled. You can re-trigger free spins during the free spins feature. Scatter wins are multiplied by the total bet. All bets and paylines played in free spins are the same as the game that started the free spins feature. Scatter wins are added to payline wins. All wins pay left to right except for scatters, which pay any. Only the highest win will be paid out per selected line. All wins are multiplied by the credits staked per line except for scatters. In expert mode, you can take advantage of Worldcup Mania’s autoplay feature if you wish. Advanced settings in autoplay are the number of spins (5, 10, 25, 50, 100, 250 and 500) and to stop if a win exceeds or equals ($100, $500, $1000, $5000 or $9999). The autoplay feature will stop if you trigger any feature in Worldcup Mania. You can cancel the autoplay feature at any time. While Worldcup Mania is nothing extraordinary, we feel it is a decent enough video slot. This is largely due to the fact that the game is now four years old at the time of this writing. The game has a free spins feature with a multiplier, a bonus game (as simplistic as it may be) and a 7500 coin top fixed jackpot. That’s all a lot of people can ask for in a video slot. For a 100% up to $100 signup bonus that you can easily clear by playing Worldcup Mania, please sign up at River Belle Casino. Are US players able to play Worldcup Mania for real money? No, Microgaming casinos are not accepting US players at this time, thus US players are unable to play the Worldcup Mania slot machine for real money. For a soccer-themed slot machine, players from the United States can play Global Cup Soccer at DaVinci’s Gold Casino. Are there any casino games based on the world cup?